This month's electro guest for Kittylitter is the Paris dwelling wonder kid BOBMO. After releasing a slew of singles and remixed for ARCADE MODE, INSTITUBES, MAD DECENT, DIM MAK and being pushed on the ED BANGER mixmag CD, he has just released his new EP "Falling from the Crescent Moon' and is set to release nine more EPs with good friend and co-producer SURKIN under their HIGH POWERED BOYS moniker. Continuing on from our last massive party with Les Petits Pious of Boys Noize, this is set to be another banging night of electro from one of the stars of the scene. Don't miss out on it! Check out this video of Bobmo & Surkin killing it at the Institubes vs Boys Noize party! Bobmo & Surkin are "The High Powered Boys". Just put out a new EP together. This Friday! We have been assured that he will be able to fly over from Paris. 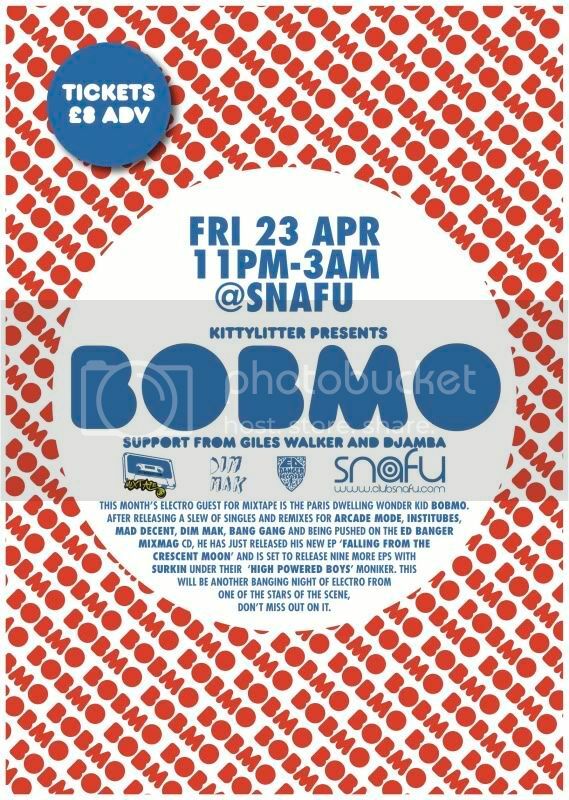 BOBMO @ Snafu tonight! A full on electro onslaught from 11pm - 3am. Support from Giles Walker and Djamba, pre-party in The Athenaeum from 9pm with Krazzy Martin and Yoin providing some fine tuneage to whet your appetite. Tickets 8 advance from One-Up, ticketweb.co.uk and The Athenaeum.